The Interior Ministry of Georgia stated on Wednesday that the torture charge has been added to the high-profile murder case of rchil Tatunashvili, who sustained over 100 wounds before he was killed. "Tatunahsvili’s corpse reveals obvious signs of torture. 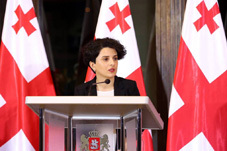 Consequently, we have made a decision to add a qualification of torture to the ongoing investigation, which was in progress under a qualification of murder and unlawful deprivation of liberty,” Deputy Interior Minister Natia Mezvrishvili stated. Giorgi Tatunashvili, the Father of the killed 35-year-old man, says that he trust the investigation carried out by the Georgian law enforcers. The Georgian Minister of Reconciliation and Civil Equality Ketevan Tsikhelashvili said that the examination report by the Tbilisi Forensic Bureau released on Tuesday, “confirms that there were more than 100 injuries on his body”. “This makes it clear that he [Tatunashvili] was subjected to torture and inhuman treatment,” she said. Tatunashvili and two other Georgian citizens were detained in the occupied Akhalgori area by Russia-controlled border guards on February 22, allegedly for participation in the Russia-Georgia 2008 war. [However, Tatunashvili did not fight in the war as he served in Iraq peace mission during the war]. Tskhinvali media announced the death of Tatunashvili on February 23, and stated that the latter had an incident with detention facility staff and fell down a flight of stairs. However, the de facto security service of Tskhinvali claimed Tatunashvili died from heart failure. Tskhinvali refused to hand over the body to his family and said that they needed time to conduct a "comprehensive autopsy." Levan Kutashvili and Ioseb Pavliashvili, who were detained with Tatunashvili, were only able to leave the occupied region on March 11. The United States, NATO, the European Union, a number of other countries and almost all international organisations urged Russia and the de-facto leadership to hand over Tatunashvili’s body to his family and allow Kutashvili and Papunashvili return across the occupation line. Georgian Prime Minister Giorgi Kvirikashvili also called on the leadership of the Russian Federation to take joint steps and resolve the issue "complicated situation”. Russia responded that this issue was far out of the framework of the Russian-Georgian agenda. On March 19, the parliament’s majority and minority agreed on joint resolution over Archil Tatunashvili’s death. Tatunashvili’s body was returned to Tbilisi- administered territory on March 20, with his internal organs removed, which complicates the case investigation process for Tbilisi.